It's not too late to get yourself to Seattle this weekend for one of year's most enjoyable festivals, Bumbershoot, now in its 31st year. It's held in the heart of that scenic and great city on the grounds of the 1962 World's Fair. There's an unusually wide variety of music, comedy (Eugene Mirman! ), authors, and visual art, and even a family friendly series of offerings ("Youngershoot"). I'm heading up there Sunday for the privilege of seeing The Replacements (photo above) and an all star tribute to Big Star featuring original drummer Jody Stephens, performing the band's classic record Third / Sister Lovers with Mike Mills, Ken Stringfellow, Mitch Easter, Chris Stamey, various other musicians of note and a 12 piece orchestra. Festival headliners include Wu-Tang Clan, Elvis Costello, Foster the People, Panic! At The Disco, and The Head and the Heart. 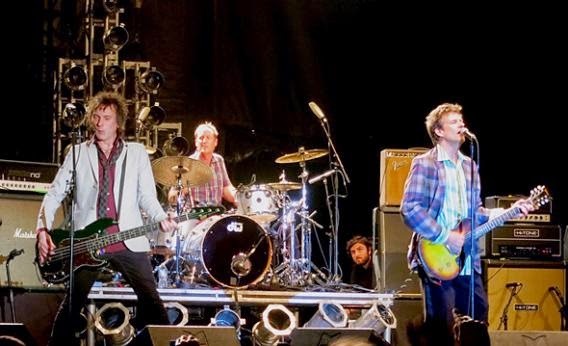 We'll report back on what we see up there, especially how the mighty Replacements, or what's left of them, performed. Many bands we've covered here at WYMA will play at Bumbershoot, including Jessica Hernandez and the Deltas, Red Fang, Los Lobos, Polica, Pickwick, and Lonely Forest.